I have a roundish face...these are my PRO FACE Slenderizing AKA Contouring tricks! The red areas are where you want to "shade" with your darker color foundation or powder to contour your face to perfect cheekbones and shape! I have used BLUNT from MAC (what I'm holding up in the picture above) for a long time...i's totally matte, no shimmer or sparkle..and it looks great on pretty much everyone. ANY face powder that's shades darker than your skin will work great too! LET's get ready to CONTOUR BABY! well what do you do if you dont have such a contour-pencil-thing? I've always been very cautious about contouring because I've seen a lot of women who look like they have dirt smeared on their faces. What causes that and how can I prevent it? I contour my face like that - learned that from you, but my face is not round, it's more of an oval face - it doesn't look bad to me but I usually have my fringe down and I do have a quite a big forehead. But should I contour like that? Kandee i need help, i have a big problem with dark circles, i everything, from mineral make up tocreamy concealers, nothing works. I saw your tutorial and tried that but i guess i need specific brands cause a couple of hours later there they are again. Please can you make a new tutorial for this? Kandee!!! This is the 1st time that I've left a comment. Not because I didn't want to but I didn't know how lol. Anyway I just want to tell you that I LOVE YOU!!! I love all your videos and all the fabulous knowledge you share with us! Thank you so much!!!! I have an issue with my mascara. It always seems to get dark under my eyes as the day goes by. Plus do you have any great tips for dark circles? THANKS!! We all know that you don't have any blemishes :D But are there any good tips and tricks to covering them in a way where it wont look so cakey and end up making the blemished areas look worse? P.s. I love your necklace, where is it from? I dont know where to begin, but can I just say that I found you about 6 months ago by a tip given to me by my mother. After watching like 10 of your videos you ignited in me a desire I buried a long time ago, to become a makeup artist myself. After that I enrolled myself in the best makeup school I could find (near my home) and despite all the challenges that I faced, I did it, and got my certificate. I just wanted to say thank you. Thank you for inspiring me to be me again and follow my dreams. I love watching your videos and really appreciate all the tips that you give. I love your spunky personality and easy going attitude. Good luck with your new baby soon. hi everyone, I have a video about dark circles too! Would you be interested in doing some videos on brush technique for those of us who ordered the Crown Brush set? Ahh! I needed to see this video...I have a VERY round face. Could you do a video on an entire make-up process for round faces? What about using darker blushes? Love your videos! Those were great tips; I really needed them because I have a super round face. hey kandee! love your vids! i was wondering if you could do an everyday natural look for people with ultra fair complections? i'm way pale and have a hard time finding an everyday natural look. with too much color i feel like i look like mimi from drew carey haha and sometimes the neutral colors show up too much on my biscuit colored skin! its ridiculous! Hi Kandee! Happy new Year! Thanks for another great video and for really sharing your knowledge. I actually take my phone with me in the bathroom and I do my makeup as I am watching your tutorials :). I love it, love it, love it! I was going to ask you the same question about problem skin - I break out a little so sometimes the shading / highlighting doesnt work as well as it does on clear skin. So I look forward to you answer to this previously posted question. Thank you. XoXo.. YOU ARE AWESOME!!!!! OH Kandee after my New years picture, OMG I looked like a blimp next to my friends. My face is huge and cheeky.....I had brightener so my pictures would be better and got a shiny slimmy looking face. RATS! So I hope this new tech works better! Thanks lovies! Haha! I love the "Pants Rule!" I LOVE this trick! I do it everytime i do my make-up now, thanks to you :) and i finally went to mac and bought blunt, and its pretty much amazing! i also just got my crown brushes in the mail! IM SO EXCITED TO USE THEM!! now i need to order the mini flat bronzer brush too! Thanks for all the great tips and tricks kandee!! That is an awesome trick. I def need to slenderize my face. Kandee, what lip combo are you wearing? I absolutely love it. I have seen it in your recent videos and would love to try it!!!!! Thank you so much for this video, Kandee. I've been hoping you'd do a contouring video for a while. Your tips were great (as always) and I always learn SO MUCH from you! Thanks again for teaching all of us girls out here in cyberspace how to improve our makeup techniques and for making us feel beautiful! Can't wait for your next video! Kandee, I think you said you had to have cosmetic surgery on your leg after your accident, but do you have any tips for minimizing scarring at home? Any products you use? I have a lot of dark scars on my legs from when I was younger, and they prevent me from being able to wear a skirt without tights... Gah! Hi! I’m from Brazil and I have a lot of fun with your videos, love them! Could you do a tutorial about how to make round and popped out eyes look more almond? I truly have this problem when I’m doing my make up. Not mentioning the dark circles, so, that tip would help me a lot. The contouring video is awesome. I've been referring back to your video for cheap flawless skin, but this really simplifies/clarifies things. Thanks. This helps me a lot! Although, I have a longer face and a rounder jaw bone. I didn't do as much contouring around my temples as much as I did around my cheek bones and it actually made a difference in both in person and pictures! Thanks for all of your great tips and I love reading both of your blogs every day! Thank you Kandee!!! I LOVE YOU, you changed my life since almost 2 years and your tricks are the best! 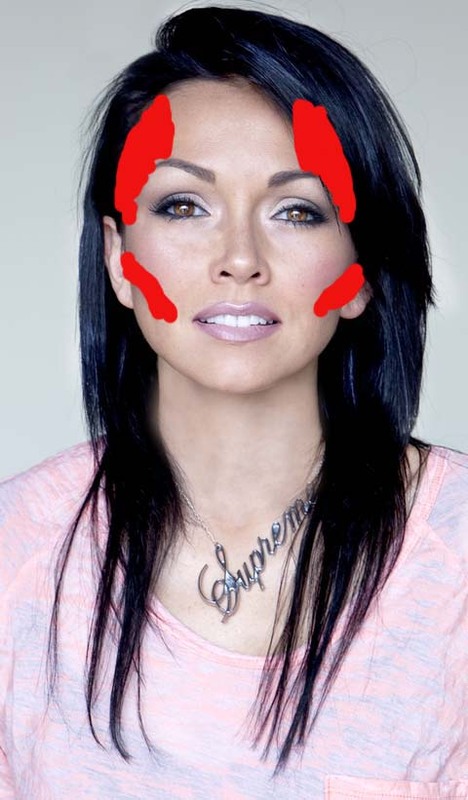 Hi Kandee. Love love LOVE your videos. This 1 gave me an idea. I have hair loss due to illness and was thinking maybe applying the darker foundation and/or powder to the hairline might help? Have you tried that before or any other tips for that? Can you do a video that she can watch? But do you use this tricks for every shape face? I have a long face, and I want to shade my face to look a bit fuller in the cheek area and not so long, how do I shade then? ok this question has probably been asked a couple times, but I swear I couldn't find the answer and looking through all the videos was cumbersome!! If Kandee or anyone else can answer..what songs does Kandee use in the beginning of her videos? Specifically the Before and After Makeup Video? By the way, got the Crown Brushes in the mail they are awesome!! Can you recommend some Concealer Sticks or Darker Foundation Powders that can be found at the drugstore, to use for this technique? Thanks so much, and I hope all is well with you! Happy 2011! I am going to start using the dark concealer to define the contouring a bit more... because I just use the powder and sometimes, it doesn't look like I put anything on... and I too have a round face... Plus I love the way the cheeks become more chiseled... it's very appealing! Thanks for this video! I ordered my brushes using the link on your post but I stll haven't received them :( I even emailed crown brush but received an automated response saying failure of delivery........ does anyone know of how to get their number? You did a wonderful job with this video. I have been following you for years now. I think I started watching your videos a few months after you started Youtube. I don't comment often because I feel intimidated with the 50+ comments all the time, like mine won't be read or have no meaning. But you have inspired me in so many ways. I have learned so much from your videos, and have gained so much more confident because of them and lots of practice. I have been working on contouring my face forever now. It is one of the first things I wanted to learn. I have a very oval face so I don't exactly need contouring, but I wanted to learn the technique. I FINALLY feel confident enough that I could do my face, or probably anyone elses for that matter now and make it beautifully contoured. Sorry to write to you on here but I just have one quick question. I am on the Crown Brush site right now and am confuse because of all the different brushes that they have... I am very new to make up and would like to start with a set of "must have" brushes. Also which type of the brushes do I use (luna, luna badger, italian badger, etc)? Please help! Thanks! Thanks Kandee!! The contouring tricks are so cool! I've definitely heard of the white and dark pants thing but never together. It's funny how that all works out. :) I'm excited to try this little trick out. Of course, I need to get some darker foundation but one I do, I will be a new, contoured me. :) AND, I am so EXCITED for my Crown brushes to arrive! Any day now, I will get them! Thanks again!!! :) Much aloha! HELP ME FIND BRUSH .Im from Canada, And im very dissapoitned, i want this brush but it seems the site has every other country but canada. Where can i find this brush for canada residents. Please Help Me xoxoxoxo. LOTS OF LOVE. I love your tips and videos! PLEASE HELP, HELP, HELP. OMGOSH, So Sorry, didn't know it would post so many, it just would not work and then it did and it posted so many, by the way i found the brush for canada, thank you,! Can u please tell me an alternative PENCIL (since the Mac one ur using is dc) I reli want to try this with a pencil...thanks a million. I <3 you and all of your videos! Can you please do a video of the beautiful look you have in this video and can you help us poor girls with very fat eyelids. I have very full eyelids and I hate them. So please do a video for that. God bless you and your beautiful babies! Hi there, not sure if you are aware of this, but did you know that your blog was voted as one of the top 50 beauty blogs by Beauty Spa School. Congratulations. My face is very skinny and narrow. Do you have any makeup tips on how to make my face look fuller? Thanks! i have very light skin, im a red head so i was wandering what color would be good to use for contouring? i wear ivory makeup and the colors above it look orangy so i dont think they would work? maybe im wrong though? as always, your blogs/tips are brilliant. i'm super excited for you, and hope new cupcake baby is born super healthy, any day now! !